Note: It’s crucial to know if you have (or want to have) a warm-season or cool-season type turfgrass species in your lawn. A simple question to ask is “Did my lawn turn completely tan or brown this past winter?” If it turned brown, you have a warm-season turfgrass such as zoysiagrass or bermudagrass. If it didn’t you have a cool-season turfgrass, such as tall fescue or tall fescue mixed with Kentucky bluegrass. Spring has kicked into full gear, and a number of targeted advertisements have been released which are aimed at rousing us out of our winter doldrums and getting into action in our lawns and gardens. For the most part, this push out the door is a good thing, and results in homeowners taking an active part in their outside environment and providing for the health of their lawn. It is critical to realize, however, that these advertising campaigns are national in nature, and do not take into account the nuances of each geographic region and climate. As any Missourian knows, Missouri’s weather is full of nuances and therefore doesn’t allow for easily contrived blanket statements. In Missouri, we are situated in the U.S. transition zone, meaning our temperatures vary widely between our winter and summer seasons. Sub-freezing temperatures during fall and winter cause warm-season turfgrasses like bermudagrass and zoysiagrass to go dormant and sometimes (perhaps after this 2014 winter) may result in winterkill. Sweltering summer temperatures cause considerable heat stress to cool-season turfgrasses such as tall fescue and Kentucky bluegrass, which can subsequently suffer from severe disease outbreaks. Because of this unique Catch-22, selecting the correct turfgrass species and cultivar that has the highest tolerance to these varying conditions is crucial to a successful lawn. Additionally, timing of fertilizer applications must match the type of grass (warm- or cool-season) that you are managing. 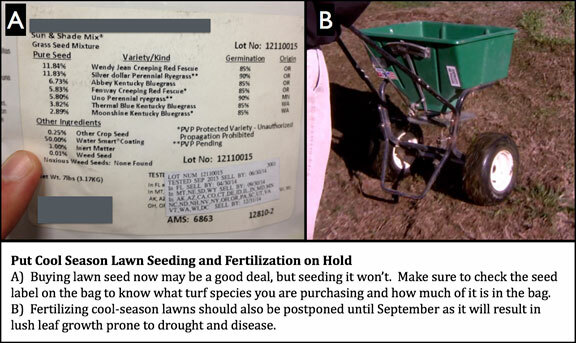 The following brief guide is intended to serve as a general guide for decisions regarding lawn seeding and management. For more detailed recommendations, please see MU extension publications G6700, G6705, G6706, and MG10. Viewing the broad array of turfgrass seed choices in the home improvement store can be a daunting experience. However, if you know your growing environment, and know what turfgrass species is most suited for Missouri, the process of elimination can be fairly straightforward. For the most part, cool-season turfgrasses are the only lawn grasses that are available to seed. Most warm-season grasses, such as zoysiagrass, will need to be sodded or sprigged and are discussed later. Several “easy”, or “ as seen on TV” seed products have been recently introduced to the market. These products are marketed nationally and may lead to utilization of turfgrass species that are not suited to the brutal Missouri environment. Pay particular attention to the state-mandated label on the back of every seed bag that describes the variety, turfgrass species (or kind), and amount of seed the package contains. If the variety is “not stated” or “NS”, then beware, as this is often cheaper seed that may come from various sources and is not adequately tested. Secondly, use a turfgrass species suited to Missouri and not to more northern climates. A mixture of red fescue, perennial ryegrass, and Kentucky bluegrass may work in Massachusetts, but would be ill suited to cope with a Missouri summer. Turf-type tall fescue, or a mixture with a very high percentage of this species, should be used here for cool-season lawns. Lastly, check the percentage of inert material that is included in the bag. This could be mulch, fertilizer, or anything else that may improve germination and establishment. However, the inert material is not seed and will impact how much yard area the bag can adequately cover. A single bag of one of these newer products may cost $30 and only cover 250 sq ft. Conversely, a 50 lb bag of an improved tall fescue blend may cost $80 and cover 7,000 sq ft for seeding a new lawn. To seed the equivalent 7,000 sq ft, the new product would cost nearly $1000. A more economical solution would include adequately preparing the seedbed (which should be done either way), irrigating effectively, and applying fertilizer separately. Far and away, tall fescue is the most appropriate and popular species for lawn use in Missouri. The turf-type tall fescue cultivars are more tolerant of heat, drought, diseases, and insect damage than other cool-season species. Tall fescue is tolerant to moderately shaded environments. Hard, sheep, creeping red or Chewing’s fescue may also be appropriate as part of a mix for use in shaded areas. These species however, have a narrower leaf blade, are not as heat or drought tolerant, and will require more frequent irrigation during a dry summer to survive. Other species commonly sold in Missouri include Kentucky bluegrass and perennial ryegrass. Kentucky bluegrass has an advantage over tall fescue in that it spreads via rhizomes and can recover more readily into damaged areas (be aware that some rhizomatous tall fescues are becoming available). For this reason, it is heavily utilized on sports fields. However, it is more prone to diseases, heat and drought stress than tall fescue and requires more irrigation and maintenance, and by itself may only be suited for northern Missouri. A low percentage of Kentucky bluegrass with predominantly tall fescue can be a good seed mixture. Perennial ryegrass is the quickest germinating grass (~ 7 days after seeding) and can provide immediate groundcover. It also is the least tolerant to environmental stresses, and will not survive a normal Missouri summer unless intensely managed. Annual ryegrass is utilized as a cover crop, but is not suitable for use as a turfgrass in Missouri. Timing of your lawn seeding is as important as turfgrass selection. Seeding a lawn in May, or even April, is often a losing proposition. The summer stress period is ahead, and young, spring seedlings are mere cubs cast into an environment full of hyenas. Fall seeding around mid September allows seedlings to develop over a full fall and subsequent spring into a lion that can deal with summer heat, drought, and disease. So now, buy (the hopefully discounted) cool-season turfgrass seed and store it in a cool, dry place until summer is over and fall provides the better opportunity to spread it. If attempting to establish a warm season turfgrass species such as zoysiagrass, bermudagrass, or buffalograss, basically flip everything around that has been previously stated. Sprig, sod, or seed these species in mid May – early June. Zoysiagrass, particularly the cultivar ‘Meyer, is the most popular warm-season lawn turf in Missouri because of its superior winter tolerance compared to bermudagrass. ‘Meyer’ is not available by seed and must be sodded, plugged or sprigged. Buffalograss, a native turfgrass species, is a hardy warm-season species that is established by seed, plugs or sod. Buffalograss is seldom used, however, since germination and establishment is slow, and requires aggressive weed control and patience. A popular commercial is currently exclaiming “Feed your lawn, feed it!”, but at this time of year it should state “Stop!” Applying nitrogen fertilizer now to cool-season lawns may be aesthetically pleasing and provide a flush of gratifying darker green color. At this time of year, and particularly into late May and early June, this dark green is in reality a fool’s gold. Late spring/early summer fertilization of cool-season lawns has two ugly drawbacks. First, the lush leaf growth comes at the expense of deep root growth, as resources are diverted towards generating new leaves (which we mow off). This resource allocation is in lieu of a deeper root system, which can scavenge limited water resources during the trying times of a hot, dry summer. Secondly, lush leaf growth predisposes turfgrasses to two devastating foliar diseases, brown patch and Pythium blight. Particularly in wet, shaded lawn areas, late spring N fertilization may make fungicide applications necessary to prevent widespread damage from these two diseases. So, like seeding, the best recourse is to save cool-season turfgrass fertilization until the fall when the plant will best be able to utilize the resource and have the summer stresses in the rearview mirror. Current recommendations are to fertilize tall fescue or cool-season lawns early- mid April with 0.5 – 1 lb nitrogen/1000 sq ft, preferably with a slow release form. Pile it on in the fall with 1 lb nitrogen/1000 sq ft in mid- September and another 1 lb nitrogen/1000 sq ft in mid-October. Similar to seeding, simply flip all of the above fertility recommendations if managing a warm-season lawn like zoysiagrass. Start fertilizing in late May – early June and apply 2-3 lb N/1000 sq ft in 2-3 equal feedings between then and mid August. Do not fertilize into September as the plant will soon be going into dormancy. As a lawyer ad would state “The choice of lawncare practice is a significant one and should not be based solely upon advertisements.” It is important to be a mindful consumer when it comes to turfgrass selection and maintenance in this dynamic climactic region of Missouri. Broad-based advertisements targeting a national audience just may not fit for this region.